You may have heard the old saying that once something is on the Web that it is there forever. It can be difficult understanding whether a scholarship listed on the Web is still active or the sponsor stopped funding it. This list may help decide which scholarships are still active or no longer being funded. The list shows how frustrating it is trying to find scholarships. Many scholarships come and go. Some scholarships have been available every year for a number of years, but the organization decided to get out of the scholarship business. However, some businesses decided to fund a scholarship for only one year and then give it up. I suspect many organizations do this for one year in order to get the publicity for marketing their business. Something must not work out for them. It is possible that some of the scholarships on this list will once again become available. It IS questionable, though. If you think that some of these sponsors have decided to fund a scholarship again, then you can use the title of the scholarship or name of the sponsor to perform a Google search in order to find more information. 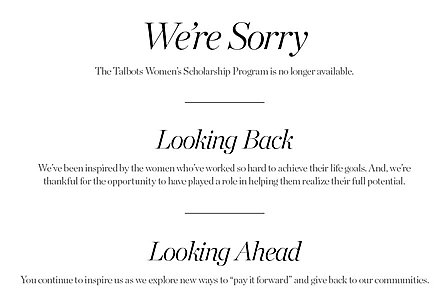 We will keep this on the list for now but after a number of years of providing generous scholarships to women, it appears that Talbot's no longer is funding scholarships. We keep this on the list so you can keep checking to see if they changer their minds. The following is the description of the scholarships that Talbot's once funded. Eligibility Requirements: Six women will each be awarded $10,000 scholarships, and 60 women will each be awarded $1,000 scholarships. All applicants must be seeking an undergraduate degree from an accredited two- or four-year college or university, or vocational-technical school. Only applicants seeking a bachelor's degree from a four-year college or university are eligible to receive a $10,000 award. Scholarship awards are based primarily on financial need and previous achievements for women who earned their high school diploma or GED at least 10 years ago. Money: Six women will each be awarded $10,000 scholarships, and 60 women will each be awarded $1,000 scholarships. WalMart no longer provides the Sam Walton Community Scholarship. However, they do provide a few other scholarships that some people will be eligible for applying, so we will keep this link on the website, for now. Hopefully, WalMart will decide to continue something like the Sam Walton Community Scholarship at a later date. WalMart provides scholarships for their associates and dependents of associates, BUT the Sam Walton Community Scholarship was for ANYONE in the community. This particular scholarship is NOT for the WalMart associate. Sam Walton Community Scholarship is for high school or home school seniors graduating or earning a GED. Part of this scholarship IS active. U.S. Bank lists the Financial Genius scholarship on thier website, but it is questionable if they continue to fund the other scholarships that they offered at one time. PLEASE continue to visit their website for updates. Eligibility Requirements: Apply for this scholarship online. It is hard to explain the application process here, so PLEASE visit their website using the URLs listed here. Winners will be selected at random, BUT you have to go through the application process. There is NO mention of an essay contest. Money: Five winners with first place being worth $20,000. The next four awards vary between $10,000 and $5,000. "From 2007 to 2012, AARP Foundation’s Women’s Scholarship Program helped low-income women win back opportunity. The Foundation’s scholarship program funded education, training and skills upgrades, leading to better employment opportunities and increased financial security for women and their families. Due to the need to fund other programs that will be able to assist greater numbers of struggling older people, AARP Foundation has discontinued funding individual scholarships through the Women’s Scholarship Program in 2013." Pursuing a technical or vocational education, an associates degree, or a bachelor's degree. Enrolled in a U.S. Department of Education accredited school or technical program within 6 months of the scholarship award date. Money: The number of scholarships and the financial award of those scholarships vary per year. However, for some years there are well over 300 scholarships awarded ranging from $500 to $5,000. $1,000 New Look Laser Tattoo Removal Semiannual Scholarship - merit-based scholarships for students pursuing higher education with an emphasis in one of the following fields: nursing, medicine, natural or applied sciences, or engineering. Eligibility Requirements: U.S. citizens or permanent residents with a minimum GPA of 3.0 enrolled or planning to enroll in an accredited college or university. Money: Scholarships are awarded TWICE a year. Each scholarship is worth $1,000. Although, the website states that this scholarship is discontinued at this time, we will keep this on the active list for now. Maybe, it will continue at a later date? Eligibility Requirements: Giva's Corporate Student Scholarship and Worldwide Community Ambassador Award is for anyone attending a college or university worldwide. This scholarship grant is aimed at assisting undergraduate or graduate students further their education as well as expand their social responsibility and community service footprint in the world. There is no specific course of study or major required. All students, regardless of major, currently attending a college or university degree program either full or part-time are eligible and encouraged to apply. The candidate must be enrolled and active as a student already, not a high school student and not waiting to attend the college/university. Topic of the ESSAY can be found at the website. IT APPEARS that the weekly contest is no longer available, BUT there are other scholarships to choose, including a MONTHLY contest. Chegg has now become MORE than just a company that rents textbooks. It appears that Chegg has acquired Zinch and now provides all kinds of college-related information, including scholarships. It appears that some of the scholarships funded by Zinch and Chegg are available, still. For a while, Chegg continued the weekly contests but scholarship contests have a tendency to change. Following is the description of the OLD Zinch scholarship contest. PLEASE visit Chegg and discover the many different and changing scholarships that Chegg now offers or will list. Eligibility Requirements: All U.S. high school and college students are eligible. Money: According to the website, SUPPOSEDLY Zinch gives away $1,000 a week. and give entrants up to 280 characters to answer the question. Zinch will pick one winner with the best answer from among all entrants. Winners of the Zinch $1000 Weekly Scholarship, or individuals who referred such winners to Zinch, are not eligible to receive any matching funds from Zinch under any Zinch matching program.” This is, practically, a scholarship without an essay. Basically, just answer a question. Eligibility Requirements: Best Price Nutrition is offering one student a $1,000 paid scholarship towards their academic costs for the 2015 school year. If any alumni wins this scholarship, $1,000 will be given to the school the alumni graduated from. Eligibility Requirements: Applicants must be enrolled full time at a single educational institution (including TRADE SCHOOL) located in the continental United States. U.S. and NON-U.S. citizens are eligible to apply. (So this appears to available for International Students). The topic of the ESSAY can be located at the website. The last date on the application is 2016. Eligibility: U.S. Citizens. Part-time or Full-time enrollment in an accredited university or tertiary school in the U.S. GPA 2.75 or higher. Sponsor: Zumper. Zumper is "a national home and apartment rental search site. Finding a place to rent has been difficult for too long, so we're out to completely change the game. We've built the first apartment search platform that not only helps you find the perfect place, but also apply for an apartment." Eligibility Requirements: Any legal U.S. resident in high school or college who will be attending an accredited university or college is eligible to apply. Zumper is "looking for outstanding students who have helped their classmates or community in a tremendous way. Maybe you started a club that raised $10,000 for charity, or championed recycling and sustainable practices across campus. Whatever it is, we’d love to hear about it!" Recipients will be selected based on the overall strength of their application materials." Eligibility Requirements: The Dry Defender Protect Your Bed Scholarship is a $1,000 award open to any undergraduate or graduate student. To apply, students must make a creative piece (comic, short film, drawing, poem, etc.) featuring the Dry Defender mascot. Proofreading Services has changed its format from it use to be. "The ProofreadingServices.com Video Poetry Scholarships reward talented young poets around the world. We offer six awards, three for high school seniors and three for university students." "In the 2015-2016 competition, students were each asked to write and recite an original poem in a YouTube video. We received hundreds of entries in both categories from applicants worldwide. The six awardees created poems that inspired and moved us, and we're thrilled to announce them here." The most recent date for the scholarship is 2015. The website says check website for next year's annual scholarship, BUT nothing seems to be updated since 2015 concerning this scholarship. Eligibility Requirements: Essay contest. More information can be found on their website. Most recent date on their website is 2015. Eligibility Requirements: Applicant must be from an approved college or affiliated program in the United States. Submit ESSAY based on topic that can be found at the website. Okay, the eligibility requirements are NOT wide open, but we feel that a number of females will be able to apply for this scholarship. Sponsor: SoundOut Social Media Management. The essay is very specific, so please visit the website for details. Money: TWO winners will receive $1,000. Eligibility Requirements: Applicants must be residents of either the United States or Canada, and be attending school (high school, college or university) full-time. Your project need not be about your place of study. Please visit the website for more details. Basically, you create some type of guide to promote your city. There is more to this, but the information can be found at the website. Sponser: United States Achievement Academy. The short story contest if of students in grades 5-12 who have been nominated for a USAA Award by an educator. Money: Scholarships and the financial award for those scholarships will vary. Eligibility: Any undergraduate student currently enrolled in an accredited US college or university with a minimum of 9 credits and a GPA of 3.0 may apply. There are no requirements for major or graduation date. Essay is required. Sponsor: National Transport Car Shipping Company. Eligibility: Be a U.S. citizen or possess an authorization to study in the U.S. Be accepted into a United States university or college and attend the school in fall 2015. Achieve an undergraduate cumulative amounting to minimum 3.0 GPA. Basically, the scholarship is open to legal residents of the following countries: Australia, Belgium, Canada, Denmark, France, Germany, Republic of Ireland, Italy, Japan, Netherlands, Norway, Sweden, United Kingdom and the United States. They must be at least 18 years old at the time of application, and must be currently enrolled in an accredited undergraduate or graduate program.Send us a photo, an essay, a video, a song, a poem or anything you can send via email to explain how a piece of software or technology has helped you to perform at a higher level academically than had that piece of software or technology not existed. Topic may change per year. Money: First Place is $2,000. Second Place is $1,000. Third Place is $500. It looks to us in 2017 that this scholarship is no longer available. Their scholarship website states the year 2015 on their web page. There does not seem to be an easy way to contact them, either. For now, we are considering this scholarship inactive until we hear otherwise. Eligibility: Women earn almost 60% of all bachelor's degrees in the United States, but they earn only 20% of computer science degrees, 20% of physics degrees, and 18% of engineering degrees. And estimates show that by 2018, the U.S. will face a shortage of more than one million STEM workers. This presents an enormous opportunity to better support young women in pursuing STEM-related careers, and Zenefits is committed to being part of the solution. The topic of the 500 word essay is located at the website. To be eligible for this scholarship, you must be a woman who: Is currently enrolled as a full-time college student in the United States; Has completed at least one full academic year of college with a GPA of 3.0 or above; Is pursuing a degree related to science, technology, mathematics, or engineering; and has clearly expressed financial need to support educational goals. Claricode emailed that they do not offer this in 2016, BUT maybe in 2016. We will check on this. Eligibility Requirements: You must be a full-time student at a U.S. accredited college or university and 18+ years old at time of entry. All majors/concentrations are welcome to apply. The website will provide the topic of an essay that must be submitted. We have not seen much information on this scholarship in the past year or so. The scholarship is still "mentioned" on their main website so we will keep this on the list for now. Money: First place is worth $1,250. They do not offer a scholarship in 2015, BUT they might offer a scholarship in 2016. Eligibility Requirements: The $500 scholarship is geared toward students living in the United States who are inspired by DIY, hands-on tasks. You must be 18 years or older to participate and you are required to be accepted into a trade school or collegiate organization. Done Plumbing and Heating is looking for an original DIY project that pertains to your job interest. The assignment is to create a DIY tutorial video that shows your process from beginning to end. Qualifications: “this scholarship is available to high school juniors and seniors, undergraduate students of any year, and graduate school students. Minimum GPA is 2.0. Applicants will be judged on their future goals and aspirations with the most weight given to the essay portion of the application.” International students attending school in the U.S. are eligible, also. Olive Garden Italian Restaurant Pasta Tales Scholarship Essay Contest (NO Longer Available). Sponsor: Olive Garden Italian Restaurant. We emailed Olive Garden to find out if this scholarship was available, still. The information was worth noting here. They wrote that they funded this scholarship for 17 years. They apologized for any inconvenience created by ending the scholarship in 2013. They did not give a reason for ending the scholarship and we did not ask. It is a very good example of how some scholarships come and go. This one lasted SEVENTEEN years. Others last only one year. Eligibility Requirements: Grades one through 12 can enter this essay contest. Money: First prize includes $2,500 savings bond. College Prowler used to offer several scholarship. It appears that NICHE has taken over College Prowler, but continues to fund, at least, one of College Prowler’s scholarships. Sponsor: KFC (Kentucky Fried Chicken). Earn a minimum cumulative high school GPA of 2.75. Money: Awards can be up to $5,000 per year. The scholar could receive up to $20,000 over four years to help complete a bachelor's degree. “For the past four scholarships, our judges have had a very challenging time choosing finalists, and once finalists have been chosen, the finalists haven't followed through with providing proof of school enrollment or citizenship. It's been as frustrating for us as it has for you, our applicants and customers. We've continued to get further and further behind in the process and feel more and more overwhelmed with each new program. U.S. Citizen. Plan on being in a college next year. Answer the questions on the website. ScholarshipExperts.com WAS TAKEN OVER by Unigo.com. UNIGO will offer similar scholarships. Campus Discovery Scholarships WAS TAKEN OVER by Unigo.com. UNIGO will offer similar scholarships. Over time, Campus Discovery has a tendency to provide a variety of scholarships with a variety of financial awards. Please keep Campus Discovery's website in mind when looking for scholarships. Here are a couple of titles of scholarships to look for with Campus Discovery. According to the website, SUPPOSEDLY Zinch gives away $1,000 a week. SCHOLARSHIP OVERVIEW: "Each week, Zinch will post a question at www.zinch.com/scholarships/weekly and/or and give entrants up to 280 characters to answer the question. Zinch will pick one winner with the best answer from among all entrants. Winners of the Zinch $1000 Weekly Scholarship, or individuals who referred such winners to Zinch, are not eligible to receive any matching funds from Zinch under any Zinch matching program. Eligibility Requirements: Open to college and university students. Must be at least 18 years old. Minimum of 3.0 GPA. Write a 400 or more word essay on a topic located at their website. Eligibility Requirements: "The Blogging for Dollars Scholarship is a creative writing contest that will award 1 winner with a cash prize to be put toward higher education expenses. This scholarship is limited to either a high school senior, or students currently enrolled in a collegiate organization. The ideal competitor will be anyone who has an interest in real estate, writing, or business, but that is not a requirement. The blog post will be judged based on originality, creativity, and imagination. We are looking for a published blog about describing your dream home, along with the Blogging for Dollars Scholarship banner at the bottom of your piece. Once the blog is published, please send us your URL along with your name, your school, and your area of study." Eligibility Requirements: Applicant must be enrolled at a recognized two- or four-year college or university in the United States. One essay / application per person. Applicant must be a legal resident of the United States or hold a valid student visa. Include in email: Name, Address, Phone Number, School Name, Date of Birth, if under 18 include Parent/Guardian Name. Eligibility Requirements: Write ESSAY for the topic located on the website. Please be advised the TruFit Good Citizens Scholarship program is no longer being offered. Please know that our commitment to our student borrowers and our community is still a top priority. We’re especially proud of the Gear for Grades program. A part of Citizens Helping Citizens Strengthen Communities, this program allows us to contribute to the economic vitality of our communities. Citizens Helping Citizens Strengthen Communities is part of the bank’s broader Citizens Helping Citizens program addressing five key areas: hunger, housing, economic development, financial education, and volunteerism. Get more information about Citizens Financial Group’s community initiatives online. With our private student loan options, and One Deposit Checking, we have smart financial solutions for good citizens like you. Eligibility Requirements: The requirements are a little complicated so please visit the website for much more information. Eligibility Requirements: Smith Monitoring is offering a prospective or current college student the opportunity to receive a $1,000 scholarship to assist in the costs associated with attending school. Essay Contest. Eligibility Requirements: high school student OR undergraduate student. U.S. citizen or permanent resident. Have at least 2.0 GPA. Money: The five finalists will receive a $2,000 scholarship. Be under 25 years of age. High school senior or be in first year of college or university. Resident of U.S. or Canada. Answer a couple of essay questions. Eligibility Requirements: Everyone has a vision -what's yours? Let Visine know what your vision is. The judges are looking for "visionaries" who excel academically, demonstrate leadership in community service and extracurricular activities, and are making huge strides toward their goals. High school students and students already in college can apply. You will need to create an account at the website in order to apply. "The Visine Students with Vision Scholarship Program will grant $5,000 merit scholarships to enrolled college students and graduating high school seniors who demonstrate a clear and unique vision, strong ambition and determination to bring their dream to life. In addition to academics, leadership in community service and extracurricular activities, applicants' personal stories of how they are moving toward their goal will be considered." Money: Ten people will receive $5,000. More information can be located at: http://www.visine.com/scholarship. PLEASE visit http://adplegal.com/scholarship/ for MORE information. Sometimes when you see a specific scholarship that you get a feeling that the scholarship will NOT be around long. That is what we believe with the following two scholarships. As far as we know, they are NOT being offered. The following two scholarships have very similar requirements, but yet are presented by two different companies. We are not quite sure what is up with that ? Maybe use caution when applying? Eligibility Requirements: Be U.S. citizen or permanent residence with a minimum GPA of 3.0. You need to be enrolled or planning to enroll in an accredited college or university. Application: Three components must be submitted for your entry: (A) Application Form, (B) Small Writing Project, and (C) Copy of transcript. Eligibility Requirements: "All candidates are encouraged to apply! Scholarships are open to all students including but not limited to: graduating college seniors, adults returning to school, single parents going to school, military students, undergraduate students, graduate school students and more. Students may be enrolled as half-time or full-time students." How has staying organized attributed to success in your academic, professional or personal life? What link is there between a clutter-free workspace and increased productivity? How has self storage improved your lifestyle? What is the relationship between organizing your home and lowering stress levels? Money: There will be five winners with each winner getting $1,000. Eligibility Requirements: Open to enrolled full-time college freshmen, sophomores and juniors, as well as high school seniors in the United States who will attend college. Write a 1000-word essay on one of the topics provided at the web site. Please visit the website for more information, but it appears that you make blinds with whatever material that you choose. Send Blindsaver.com some pictures of your creation along with a hundred-word or so description of your project. We know that this may not appeal to everyone, but for many people, creating this project is a whole lot better than writing a paper about yourself. We suspect that this is NO longer available. Eligibility Requirements: $1,000 annual scholarship to be awarded to applicant chosen. Scholarship shall benefit any person 17 years of age or older who is currently accepted to a college program but not yet started, or any current undergraduate or graduate student who is currently enrolled in and attending an institution of higher education. Applicant must have a minimum of 3.1 GPA based on the previous year’s academic performance. Eligibility Requirements: You must be a graduating high school senior or a freshman or sophomore in college. You must not be related to any Free Country staff or extended family. Blaze WiFI has announced that they will offer another scholarship in 2015. Eligibility Requirements: “At this time our scholarship is open only to college-bound HS seniors and students enrolled full-time in an undergraduate or graduate level degree program at a college or university located in the United States. You can apply for the Blaze Wifi Scholarship for Rural Students if you meet the following criteria: You are a United States citizen or a permanent legal resident of the U.S.; You are a full-time student enrolled in an undergraduate or graduate-level degree program at an accredited college or university or a high school senior planning to attend college in Fall 2014. You have a current grade point average (GPA) of 3.0 or higher; You are NOT an employee of or related to an employee of Blaze Wifi. The topic of the BLOG/ESSAY can be found on the website. “In order to be eligible for this scholarship, students must read the book stated above in its entirety. In addition, the student must be a United States citizen who is either a senior in high school or a student who will be or is enrolled in a university, college, or trade school. Sponsor: Linda Lael Miller, the author. Linda's website states: "The 2014 competition closes out Linda’s long-running scholarship program, for which the author has awarded approximately $150,000 in grants over the years." Although it appears that this scholarship has come to a close, we will continue to list this in case the scholarship is continued sometime in the future. Be a woman at least 25 years old. Legal resident of U.S. or Canada. Attending U.S. or Canadian college. Submit application form and an essay. The topics can be found on her website. Money: Over $10,000 in scholarships is awarded. Sponsor: Talbots Inc., the retailer and direct marketer of women's apparel, shoes and accessories. We will keep this description on the list for now. For a number of years Talbots offered very generous funding for scholarships. Maybe they will change their minds and fund scholarships in the future? Eligibility Requirements: This is one of the VERY FEW scholarships for women (specifically for women) that has a very minimum amount of requirements. Just about any woman / female in the U.S. or Canada can apply for this scholarship for women. Women in the United States or Canada. Earned a High School Diploma or GED. Be enrolled or plan to enroll in an accredited college. Money: Talbot’s is known to offer a number of scholarships to people. The amount of the award is subject to change each year, but usually the awards range between $5,000 and $30,000. Eligibility Requirements: This one is pretty easy. No scholarship essay is required. Basically, fill out a survey and wait to see if your name is drawn. Here is a quote from the website: “Choosing a college is difficult enough without wondering how you're going to pay for it, and AnyCollege.com has set up a fund to award college scholarships for prospective students in order to ease the burden. Simply fill out the short survey below and you will be eligible to win a college scholarship in our next drawing. Scholarships will be awarded through random drawings.” All students are eligible, U.S. citizen or non-U.S. citizen. The student can use this money for a college, university, or technical school. Money: Four scholarships are awarded. Each scholarship is worth $2,000. Eligibility Requirements: "Having attended college ourselves, we appreciate the difficulty students face in financing their education, and we recognize the benefits a college education can provide. That's why our general scholarship rewards students who are looking to better themselves, who have goals and dreams, and who are committed to achieving a college degree and a successful future. US students who are 16 years of age or older are encouraged to apply for our scholarships. High school students, undergraduate students, master degree students, and adult learners are all also encouraged to apply." Okay, we know that this is NOT exactly a no essay scholarship, but the questions that you answer MAY be appealing to a lot of students. The answers are short essays, BUT the questions may be of interest to students who would not normally like to write an essay. There are NOT many "no essay" scholarships out there, so we decided to add this scholarship to this list. After all, this scholarship is offered TWICE a year AND $1,000 for a scholarship is a very good financial award. You answer questions listed on the website. Money: Two awards a year worth $1,000 for each scholarship. Eligibility: The 5th Annual “Design-A-Sign” Scholarship Contest encourages aspiring designers to show off their creativity and enter to win a scholarship to a college, university or trade school of their choice. The Contest is open only to anyone in the 50 U.S. states and the District of Columbia, excluding U.S. territories, that has registered with Signazon.com for the Contest. Entrants must be at least 13 years of age and U.S. residents, and if under the age of 18, must have obtained their parents’ or legal guardians’ prior permission before entering. PLEASE visit their website for design requirements. Money: First Place is $1,000. Second place is $200. Third place is $100. Datatech Labs "Data Recovery Scholarship YouTube Challenge"
High school senior accepted to a college/university/trade school. A student currently enrolled in a college/university/trade school. Eligibility Requirements: Complete a short survey AND submit your 500 or fewer word essay on one of the topics supplied at their website. We will not go into much detail about these scholarships because the most up-to-date information will be at their website. The scholarship and money has varied over the years. Like the quote above states, this organization has offered, at least, a video contest AND an essay contest over the past number of years. Sponsor: Daniel Kovach Scholarship Foundation. Eligibility Requirements: U.S. Citizen. Female. Have at least a 3.0 GPA. Student needs to be enrolled in college. Provide an essay. This online company provides information about colleges, scholarships, and more. It does sponsor an annual $1,000 scholarship and the scholarship appears to have almost no eligibility requirements. There is A LOT to understand so we advise you to visit the website and read the rules and eligibility requirements. Although there may be more to this contest than some other essay contests, there IS a lot of money in awards for this particular contest. It appears that this is open to INTERNATIONAL students. Money: The money will vary per year. Contact Information: PLEASE visit the following web pages for topics, rules, and requirements. THERE IS SOME QUESTION if this organization will continue to fund this scholarship. Sponsor: American Public Health Association (APHA). "To raise awareness about emergency preparedness, APHA is offering its fourth annual Get Ready Scholarship. The scholarship is a component of APHAs Get Ready campaign, which works to help Americans prepare themselves, their families and their communities for all disasters and hazards, including pandemic flu, infectious disease, natural disasters and other emergencies." U.S. high school seniors graduating who plan to further their education at a college, university or certified trade school in the summer or fall; Currently enrolled U.S. college or university students who will be continuing their studies at the undergraduate or graduate level in the summer or fall; Currently enrolled U.S. college or university graduate students who will be continuing their studies at the graduate level in the summer or fall. PLEASE NOTE: This web page seems to come and go. Please keep checking IF the web page does not appear. Please contact the website for updates. Sponsor: First Choice College Placement. Eligibility Requirements: "Any 9th-12th grade high school, college, or graduate student. There are no age limits but you have to be a U.S. citizen or legal resident." This is an ESSAY contest. Money: The award is presented bi-annually. The money varies between $250 and $1,000. Eligibility Requirements: Applicant must be either a recently graduated high school senior who will enroll as a freshman at a four year or two year college or university OR a student currently enrolled on a full-time basis at an accredited four-year or two-year college or university. Must have a GPA of 3.0 or higher. Be a U.S. citizen OR permanent resident of the U.S. Write an ESSAY based on the topic located at the website. The essay much be the applicant's original work. There may be more than one scholarship listed at this website. Please look around this website. Eligibility Requirements: Write an essay based on topic listed at the website. Applicant must be a U.S. Citizen or Permanent Legal Resident of the United States and may not be an associate (employee) of any division of DigiCert, Inc.
Tutor the People has changed the eligibility requirements to say: "Our current scholarship is offered for pre-medical students. " This scholarship might come and go. It is worth keeping it on this list, for now. Eligibility Requirements: Open to high school and college students. Topics for the essay contest can be found at their website. Not active at this time. Their website has listed their scholarship application with a date that is a couple of years old. That is like about four or five other scholarships that we have decided to keep on this list, for now. We did contact SaveOnEnergy.com by email and they replied saying that their scholarship is not active at this time, BUT they might fund the scholarship sometime in the future. A thousand dollar scholarship can be helpful, so we will keep this scholarship on this list for now. This is a scholarship that you may want to check on, sometime in the future. Eligibility: College students enrolled full time at a two or four-year university for the upcoming school year (and who will continue such full-time enrollment throughout the entire academic year) are welcome to apply for the scholarship. Each applicant must attend an accredited university as found on the official website of the Department of Education. All applicants must be U.S. citizens or permanent legal residents of the United States. This is an ESSAY contest and topic can be found on their website. Eligibility: Any current, full-time student enrolled in an accredited university or college in the United States, with a cumulative grade point average of at least 3.0. There is no age requirement for scholarship applicants and incoming freshmen are encouraged to apply. This is an ESSAY contest and the topic is located at their website. Eligibility: The contest is open to both current college students as well as those planning on starting college in the fall. Topic of ESSAY can be found on their website. This scholarship may no longer be active, but we will keep it on the list, for now. Eligibility: Open to high school seniors and students currently enrolled in a college or university in the United States. Topic of the ESSAY can be found on their website. Eligibility Requirements: "Need to be studying full-time in high school or college." There are more eligibility requirements at their website. This is an ESSAY contest and the topic can be located at their website. Money: TWO winners will receive $1,000 each. Eligibility Requirements: "Reservation Counter is offering a scholarship program for US students enrolled in colleges, universities and private institutions. This need-based scholarship program is designed to support and motivate students to value and make the most of their education. Reservation Counter looks to give scholarship awards to deserving students to achieve higher quality education, and are actively promoting education to encourage students to improve their knowledge and strive for excellence." Money: Two different scholarships offered at different times of the year. Each scholarship is worth $1,500. Eligibility: Any current student enrolled in an accredited U.S. college or university is welcome to apply. This is an ESSAY contest and the topic is listed at their website. Sponsor: Rain Control of Central Florida, Inc. Eligibility: “This scholarship is available to any student who is attending high school as a graduating senior or who is currently registered in any accredited post-secondary institution, college, business, or technical school in the U.S. This includes home schooled students. High school seniors must be accepted into an accredited post-secondary institution.” This is an ESSAY contest with the topic listed at their website. Sponsor: Swartz & Swartz, P.C. / Boston Personal Injury Lawyers. Eligibility Requirements: Need to be a college student or about to enroll in college in the U.S. There are more application requirements at their website. This is an ESSAY contest and the topic can be located at their website. Okay, we are going to put this back on this web page. For awhile, it looked like this scholarship was no longer available, BUT apparently this is valid again. It seems to come and go so we will keep this on the list, for now. "NursingTrack.com is offering a $1,000 Nursing School Scholarship available to any student participating in a qualified undergraduate, graduate or certificate level nursing program. This award is given out once every year." Well, if we are going to put the Nursingtrack.com nursing scholarship back on this web page than we might as well do the same for the Outlaw Student.com nursing scholarship. It sure looked like this was NOT available for a couple of years, BUT it appears that this is valid again. We will keep this on the list, for now. "Whatever your reason for going to nursing school, you’ll need money to get there. That’s why we created the $500 Nursing Scholarship, offered four times per year. Apply online now. Check the deadline schedule below for the current application dates. The scholarship is awarded four times annually. Our nursing scholarships are $500 each, and they’re granted every three months. Unlike most scholarship programs, the checks are written directly to you instead of your school, so winners may use the money not only toward tuition, but books, living expenses, etc." Money: Varies between $1,000 and $10,000. U.S. Medical Supplies is a top supplier of medical supplies and mobility aids such as lift chairs, mobility scooters, stair lifts, and wheelchair lifts. U.S. Medical Supplies recognizes the importance of education and the incredible potential of tomorrow's medical professionals. This program is available to entering freshmen, full-time college students who are pursuing a course of study with a degree in a medical field, including nursing. Applicants must be legal U.S. residents. You must be enrolled in an accredited two-year or four-year school, or a graduate program in the United States. Current high school seniors must have committed to a specific school before applying.Applicants are required to answer an essay question in approximately 500 words. Eligibility Requirements: This program is available to entering freshmen, full-time college students who are pursuing a course of study with a degree in a medical field, including nursing. Applicants must be legal U.S. residents enrolled as a full-time student in an accredited two or four-year school. Applicants are required to answer an essay question. Money: THREE Awards worth: $3,500, $1,000, and $500. 3901 A. Commerce Park Dr.
You must be a single parent helping to raise at least one child. You do not have to have full-time custody but must be involved in raising the child. You must be currently enrolled in a U.S. high school, trade school, apprentice school, junior college, college, university, or graduate school in the United States. You must have a GPA of 2.7 or higher and are required to submit a copy of your transcript indicating your grade point average (GPA). You may submit an unofficial school transcript. This includes a 300 to 600 page essay with the topic listed at the website. Money: One $1,000 scholarship for a single mother and One $1,000 scholarship for a single father. IF this is the first page of our website that you have seen and are looking for ACTIVE scholarships, then please visit http://www.grantsscholarshipsandmore.org. The following resources will help you find more active scholarships, BUT more information is available on our other web pages. YouTube Video: How to Find College Grants and Scholarships is a short six-minute video that gives you an overall look at where to find college grants and scholarships. If you have no idea on where to start to find financial aid, then this video will give you a good idea on how to go about finding free money in the form of financial aid, grants, and scholarships for college or trade schools for a variety of groups of people such as nursing students, single moms, women, and just about any U.S. Citizen seeking scholarships with the least amount of eligibility requirements. Scholarships.com is a website that will offer a free scholarship search service. PLEASE pay attention to the web pages as some of the pages/forms may be ADVERTISEMENTS for colleges that you are filling out and NOT the scholarship website's profile/registration. Fastweb is another very popular free scholarship search service that allows the student to pick a number of options for their "profile." PLEASE pay attention to the web pages as some of the pages/forms may be ADVERTISEMENTS for colleges that you are filling out and NOT the scholarship website's profile/registration. College Grants and Scholarships with the Minimum Amount of Eligibility Requirements is a Kindle ebook that lists approximately 150 college scholarships that have the least amount of eligibility requirements, so that just about any U.S citizen or legal resident can apply for these scholarships. There are only so many scholarships for a specific group of people, whether it is Hispanic, single mothers, women, nursing students, veterans, or other groups. This ebook can provide a list of more available scholarships. Some of these scholarships require writing an essay while others require filling out just an application. There are NOT many scholarships available without specific, limiting criteria. There are many resources that will list thousands of scholarships, but a majority of them will have very specific requirements that prevents many students from applying to most of the scholarships listed in the resources. However, this Kindle ebook lists scholarships that most people within the U.S. can apply for. If you do not have a Kindle, you can download the free Kindle Previewer in order to view Kindle books on your PC at http://www.amazon.com/gp/feature.html/?docId=1000765261 OR https://kdp.amazon.com/self-publishing/help?topicId=A3IWA2TQYMZ5J6 . We know how difficult it is to format documents for the Kindle so the formatting might be kind of strange for some of the text. However, we find the text tolerable and the links work.